Tulsa OK (September 20, 2016)- After a cancellation last Friday due to early morning showers that left the Southern Oklahoma Speedway grounds unusable, the Ameri-Flex / OCRS sprint car series will take another shot at competing on the 3/8-mile oval this Friday night as the fight for the series championship looms on. Racing is set to begin right after after 7:30pm warm up sessions for the Ameri-Flex / OCRS sprinters along with the Sprint Series of Oklahoma and the Wingless Outlaw Warrior sprints that will also be part of the all sprint car program. $1500 awaits the winner of the Ameri-Flex / OCRS portion of the program along with additional elevated purse money available to the contestants in the 25-lap Ameri-Flex Hose & Accessories main event. Defending Ameri-Flex / OCRS champion Robert Sellers leads the chase for the 2016 championship by a slim 17 points over Whit Gastineau. Each driver has tallied three wins thus far in the season. Zach Chappell (with 2 wins) sits in the third spot only 45 points out of first and just 28 markers behind Gastineau for the runner-up spot. Of these three, only Sellers has secured an Ameri-Flex / OCRS crown. The Ameri-Flex / OCRS 2016 awards banquet will be on November 19, 2016 at the 'Signs of the Times' in Sapulpa OK. BBQ dinner will be catered by former racer Roger Eckhardt. Tickets will be $20 per person payable at the door. As always, fans of the series are welcomed and encouraged to attend. Dinner is at 6pm with the awards ceremony starting after dinner. Entertainment for the evening will be announced at a future date. It is highly recommended that you arrive early as parking will be in and around the business district of the facility. Sheldon Barksdale was on fire the first half of the season as he collected five wins (which leads the series). He snared number five on July 15th at the Humboldt Speedway in Kansas. Barksdale has ran in the top 5 multiple times since, but that 6th win is getting harder to come by. If Barksdale should win one more, he would equal what Robert Sellers did last year. If he should win two more, he would equal what Harli White did in 2013. This weeks all open wheel program is a dream of fans who like their racing fenderless. Nothing would be more pleasing than to see multiple racetracks in the region present this type of offering to their fan bases. It is also a unique opportunity to reach out to those fans that attended open wheel only shows in the 60's - 90's that otherwise seldomly come out to the racetrack. Specials like this is a nice change of pace. Turn south onto Hwy 77. Racetrack is approx. 2 miles on right. 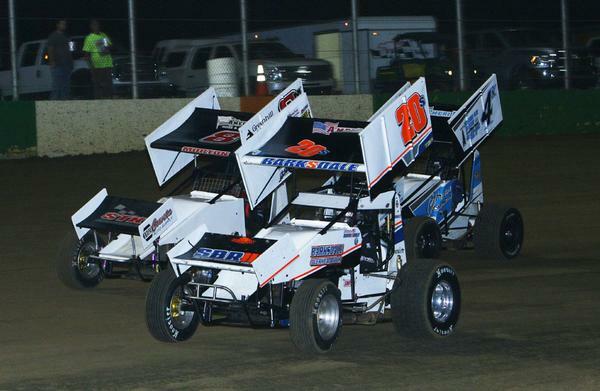 Established in 2002, the Tulsa Oklahoma based Ameri-Flex / OCRS series sanctions sprint car racing in the southern region of the central plains. Fan appeal and quality race teams combined with our solid core of supporting sponsors are the nucleus of the series. Thrilling competition providing the ultimate quality family entertainment is the essence of what the Ameri-Flex / OCRS series is all about.